On a rare day when the cares of life are absent and my mind is clear; on a cold day when the sky is leaden; in the late afternoon when the light is fading and the fire is flickering I sometimes retreat to the kitchen and mix up some spices. They have become stocking fillers, people leave the house sometimes and whisper – ‘you don’t have any spare curry mix do you?’ And then I can open the cupboard and there they are in little jars, bright yellow, dark orange, ochre, dusky brown. 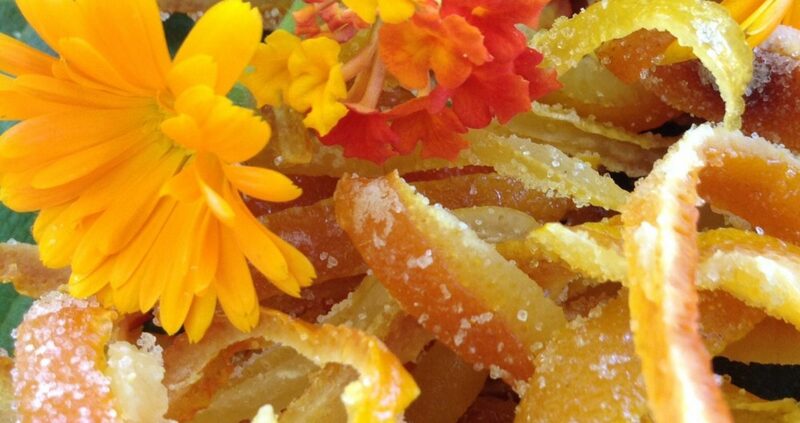 Fragrant, warm and delicious. Just waiting to be added to dark squash and onion, or pink lamb, or a vegetable biriyani. Here are a few of my favourites – but before you are tempted, get yourself down to the Indian supermarket and stock up on the ingredients. Make it a job for next week end! 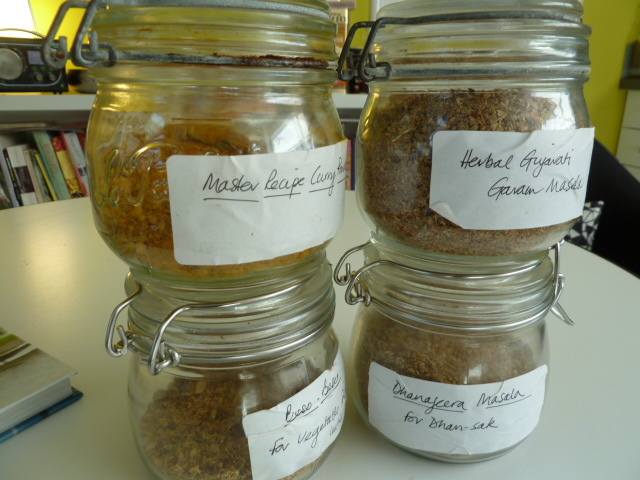 These spice mixes come from two of my favourite books. Lord Krishna’s Art of Indian Vegetarian Cooking by Yamuna Devi which I picked up in the remainders box in Jarrolds about 25 years ago, and Classic Indian vegetarian cookery by Julie Sahni which is a two volume affair. 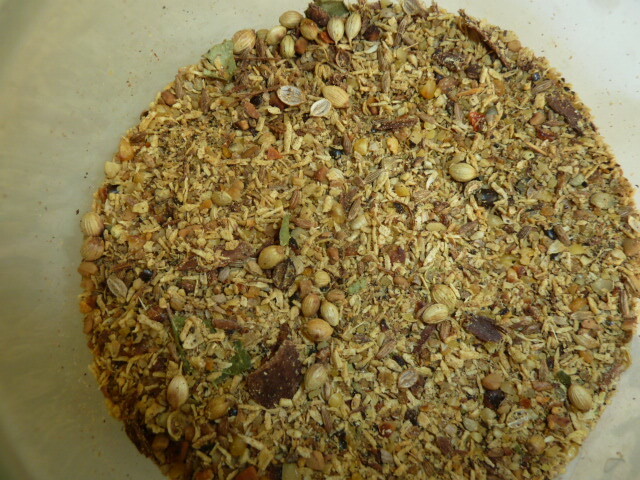 A note about method – always ‘dry roast’ spices in a medium hot heavy based frying pan and then allow to cool. Then either grind in a pestle and mortar or in an electric coffee grinder (I use a second hand one kept just for spices which I got free from Freecycle about 10 years ago). Whatever you do, keep your head out of direct line of fire as the vapour from hot ground spices can be potent! Mixing your own spices is very satisfying and it is not an exact science, so experiment with small amounts and variations until you get the balance that suits you – inevitably this will apply to heat (as in chilli hotness) but also to the balance of proportion in the spice mix. It’s a delightful experiment. 8 tablespoon coriander seed, 15 dry red chillis, 1.5 teaspoon cumin, mustard, fenugreek seed, 1.5 teaspoon black peppercorns, 15-20 curry leaves, 3 tbsp turmeric powder. Dry roast all the ingredients except the turmeric powder, cool spcies slightly then grind in pestle or electric grinder and add the turmeric. Mix carefully and allow to cool, then transfer to an airtight jar. 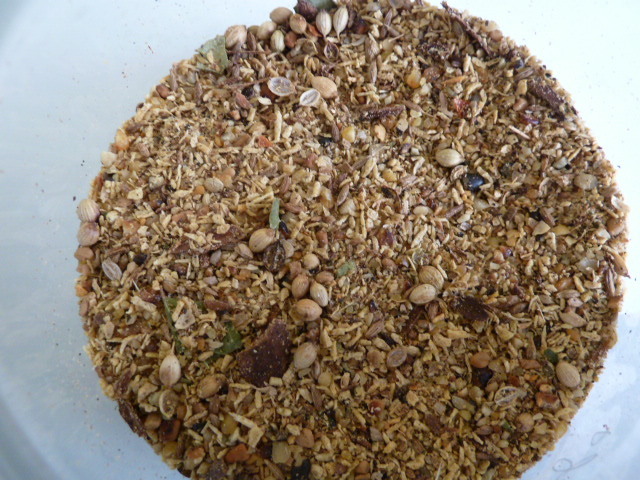 This mix has a lovely spicy nutty flavour which comes from the dried beans and peas. These then add their starch to the sauce and thicken whatever you are cooking. 8 tablespoons of coriander seed, 12 whole dry chillis, 1.5 teaspoons of cumin seed, black peppercorn, yellow mung beans (moong dal), yellow split peas (channa dal), fenugreek seed, white split gram beans (urud dal), 2 tablespoon turmeric. First dry roast the spices and transfer to a bowl, then dry roast the legumes, stirring all the time until they are barely coloured (about 6 minutes). Transfer to a bowl. Then add the turmeric to the same hot dry pan and roast till it loses its raw aroma but don’t have it on the heat. This takes a couple of minutes. 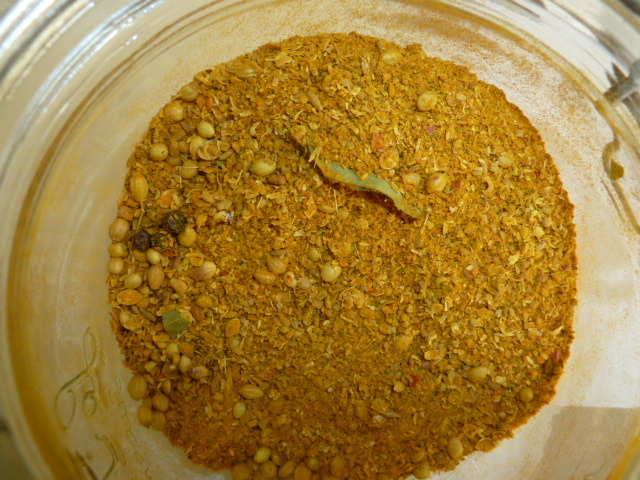 Then grind all the spices and legumes together and add to the cooled turmeric and mix well before transferring to storage jars. This is my favourite. 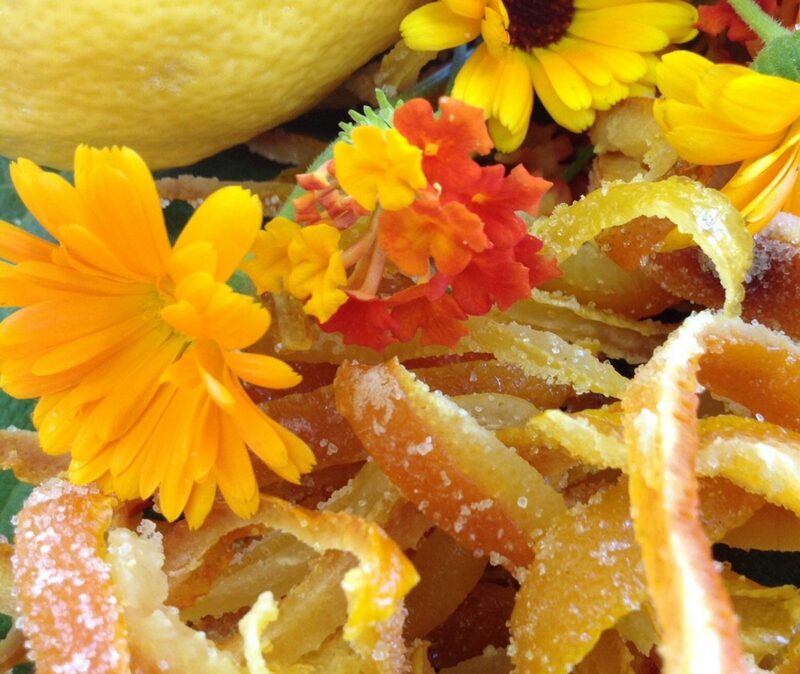 It is very aromatic, with the warmth of cinnamon and clove. Traditionally it is used to flavour vegetable, rice and pilaf dishes. It is expecially good with aubergine. Dry roast 4 tablespoon yellow split peas (channa dal) for about 5 minutes then add , 6 tablespoon white split gram beans (urud dal) and roast for a further 8 minutes, stirring all the time. They need to slowly roast but not burn. Transfer to a bowl and cool. Dry roast 3 tablepoon cumin, 4 tablespoon coriander, 3 tablespoon fenugreek seeds; 3×7.5cm cinnamon sticks and about 6 cloves with 4 tablespoon dried chillis (or fewer if you don’t want it too hot). Roast for 6-8 minutes until they are several shades darker then add 2 tablespoon curry leaves and 10 tablespoons of unsweetened coconut flakes. Mix all these with the reserved peas and beans and allow to cool. When completely cool, grind them to fine powder and store in airtight jars. I tend to use Garam Marsala as a final flavouring in a curry dish rather than a cooking spice as such, stir a couple of spoons into the finished dish a couple of minutes before you take it off the heat. It adds a concluding top note to the flavour, rather like Parmesan in Italian dishes. Dry roast 4 tablespoon coriander, 3 tablespoon cumin, 2 tablespoon fenugreek seek with 6 cloves and 1.5 tablespoon black cardomom seed (you might prefer green, but I love the deep medicinal aroma of the black) for about 8 minutes. Add 8 bay leaves broken into small pieces and 8 tablespoon of unsweetened coconut flakes and 6 dry red chilli. Leave to cool then grind. Store in airtight jars.